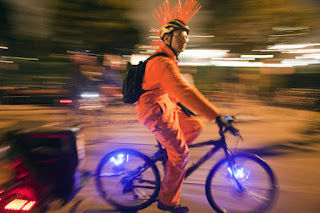 This Sunday, May 1st, Pueblo will hold it's first ever (at least that I'm aware of) Critical Mass-Costume bicycle ride. The goal of the Critical Mass is to peacefully and lawfully raise awareness about automobile related environmental issues and the cyclist's rights to share the road. The goal of the organizers is to be seen as a group, but not be confrontational by fully blocking traffic, and to obey traffic laws. And of course, to have fun and ride around with others within the bicycle community. The event will be kid friendly and safe! Sunday from 1-2 pm in City Park, (Public Pool) there will be a mobile bicycle kitchen setup to teach basic DIY bicycle maintenance and dig up volunteers for a more permanent DIY bicycle kitchen project, followed by the Critical Mass ride starting at 2pm. The ride will last approximately 1-1.5 hours and end in downtown Pueblo. So spread the word, find a fun costume, bring yourself to City Park, and help make a positive statement that will help the Pueblo bicycle community.